"Just a quick scan of nearby asteriod belts and faction warfare plexes. Won't find anything interesting there anyway considering my bad luck lately .."
Those were my thoughts when I logged into Auga last weekend on a Saturday night. I was working on a blog post (this one actually) and just wanted to copy down the fitting of my new Vengeance. Almost subconsciously I activated the directional scanner and then proceeded to check the nearby celestials for targets. Hm, two Punishers at a faction warfare site. Interesting. Might as well check it out, they will probably warp away anyway. Loading Nova Rockets to exploit their resistance hole .. here we go. Both ships were sitting at the plex beacon about 70km away from the warp-in point, surrounded by NPC faction frigates and cruisers. Checking d-scan for possible reinforcements, I powered up my afterburner and started to approach the beacon. 60km .. 50km .. 40km. They still kept orbiting the beacon and made no move to leave the site or even prepare for it by aligning. D-scan still showed no incoming reinforcements. While checking their alignment my sensor drones relayed another crucial information to me - both Punishers were Autocannon-fitted and would hopefully use either explosive or thermal ammunition to fight against my armor-tanked Vengeance, both damage types being actually those which I had the hightest resistances against. I switched from Nova Rage to Nova Javelin at this point to be able to fight within their fallout range and got closer. Without any other parameter to take into consideration I picked the Punisher nearest to me, overheated my afterburner for one cycle and tried to get as close as possible while trying to maintain a high angular velocity - yes, really not the brightest move after I had justed switched to long range ammo. 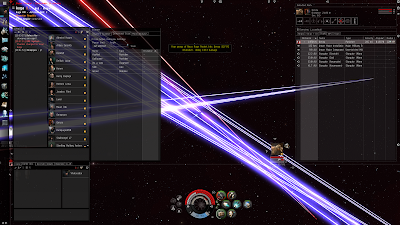 My overheated warp scrambler and stasis webifier activated, and one or two seconds later the brawl had started. An energy vampire and an energy neutralizer started to diminish my capacitor reserves fast, and both a warp disruptor and a warp scrambler shut down my warp drive. Activating my rocket launchers and my own energy vampire I settled into an orbit of about 1km around my primary target. The data provided by my overview showed that the velocity of both Punishers was still at about 300m/s and that due to my afterburner I was able to keep up a rather high angular velocity relativ to both of them. Flying through an overwhelming blaze of enemy weapon fire from both the two Punishers and the NPC faction ships, my shields quickly gave out and my armor started to take damage. My capacitor was almost empty, and I was barely able to keep up my scram and my afterburner. Pulsing the armor repper was out of the question while the enemy neut was active. For a moment I was actually starting to accept that this would be an easy win for my opponents. My rockets were doing heavy damage to the first Punisher, but surely I wouldn't be able to survive long without being to actively repair the incoming damage. Combined with the fact that due to my speed I was able to put heavy strain on the tracking systems of my opponents, my high resistances mitigated the damage being dealt by the enemy ships more than I would have thought possible. Since all three of us were now within one or two kilometers of each other, I switched to Nova Rage, and while each hit of my rockets brought the first Punisher closer to its destruction, I was doing fine. My target exploded, and with it the energy neutralizer that had prevented my armor repairer to work. Slowly but surely the capacitor level of my brave little ship started to regenerate, and after a few more cycles of my energy vampire I was able to start pulsing the repper. The second punisher started to melt as well. However, the sheer amount of glancing hits inflicted by the NPC faction ships had started to pile up, and slowly but surely my armor buffer started to lose cohesion. Too slowly for the second Punisher to make anything out of it as it turned out. He exploded, and I was able to warp out at around 20% armor remaining. Good fights were given heartily in local, and with shaking hands I realized that my Vengeance had won it's first real battle. [ 2012.02.26 20:06:11 ] Vhalasedai > neuts both of you? [ 2012.02.26 20:07:27 ] Omoprgos > any time! Thanks a lot guys, this was really great, and I would say the same if I had lost. I you want a rematch, let me know .. anytime, anywhere. Figure out which target is trying to neut you and burn it down as fast as possible. The inability of pulsing my armor repper might have cost me the battle if the Punishers had used EM or Thermal ammunition. Decide on a range to fight in, load the correct ammunition type and try to keep the range that you decided upon - I had Javelin Rockets loaded at the beginning of the fight and had to switch to Rage Rockets when the fight had already started.